Before we delve too deeply into the GT750 transmission and what can be done to improve it, let's take a moment to consider how gearboxes work. The way that gear selection works is the gear change lever is moved up or down and that rotates the long gear shift shaft which in turn acts through a ratchet assembly to rotate the shift drum. The shift drum contains three grooves which are effectively a cam and as the drum rotates, it cause one or other shift forks to move from side to side on their rails. As the sliding gears move sideways, dogs on the gear engage with dogs on one of the rotating gears so that gear is now locked to the shaft. In the case of a GT750, the input shaft from the clutch has first gear on the left actually machined into the shaft. next is 4th which rotates freely but cannot move left to right. next is 3rd gear and that is free to slide laterally on the splines. Next one over is 5th which, like 4th can rotate but not move side to side. 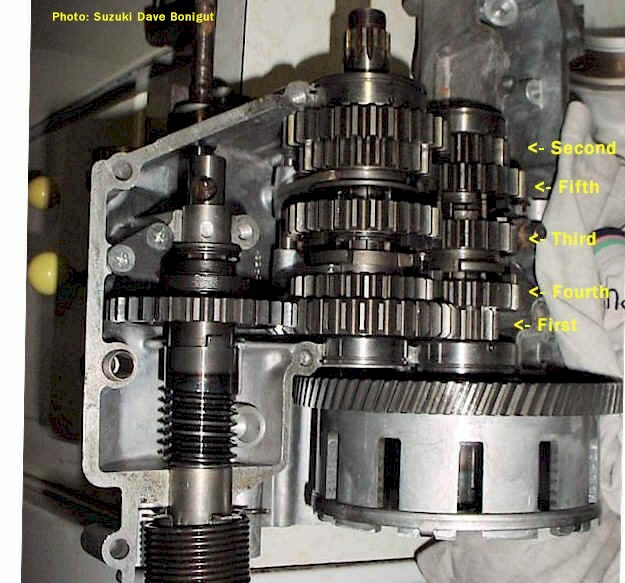 Last gear on the right is 2nd and is pressed onto the shaft and cannot move in any direction relative to the shaft. The output shaft is almost the opposite in layout. Starting at the clutch side, the first gear is 1st gear and it rotates on the shaft. Then it's 4th which is splined, 3rd which can rotate, 5th on splines and finally 2nd which can rotate. The Gt750 transmission is pretty much bulletproof but most GT750s, the ratios are too wide for a touring bike and far too wide for one that has been ported. That's not so much an indictment of the Suzuki design team, but it's a reminder that back in 1970, that's how bikes were made. Before, we explore options and improvements, let's look first at what gear sets Suzuki designers settled on for the GT750 and how they changed over the years. The J (72), K (73), L(74) and M (75) up to GT750-66220 share the same gears and ratios. At that point, fifth gear was changed for slightly lower gear which brought 4th and 5th closer. Near the very end of the A (76) production, 2nd and 3rd gears were strengthened according to a Suzuki bulletin and they changed the ratios to even out the gaps. So the last GT750 gear ratios were much better than the early ones. When Suzuki introduced the 4 stroke GS750, they took teh opportunity to use the GT gearbox and made one more small change to the gearing and it was a great change to make. And that is why people have been trying to fit GS750 gearboxes in GT750s. A modern 4 stroke has an oil pump to lubricate the cranks and cams etc, and it is normal practice to bleed off a some of that oil supply to lubricate the gear shafts. many modern two strokes also have small oil pumps to make sure that the shafts and gears are always lubricated. But back in the early seventies, that just wasn't the way that things got done. Instead of adding another oil pump to the already complex machine, Suzuki designed a series of light thin sheet metal stampings to collect oil and to allow it to run down through the shafts using gravity. the most complex of these ducts is the feed to the input shaft. Oil is collected just above the large gear on the clutch. It picks up copies amounts of oil as it rotates and some of that oil is caught by a small duct above the clutch. Oil then passes down into the small round outer cover outside the clutch and passes through a small oil seal into the clutch pull rod which sits in another oil seal in the end of the input shaft. Input shaft has a small oil seal in the clutch end in which the pull rod sits. In this shot, the outer cover and pull rod are fitted, but the clutch assembly and is removed to show how it all fits together. Note the elaborate sheet metal oil dam which guides oil to the small outer round cover and back in through the hollow pull rod and into the input shaft. Complex but ingenious. Of course if we start thinking about using gears from a different motor, such as a GS750 or 6 speed GSXR, we need to keep that in mind. Ok, so we discovered that the gear ratios in a GS were better than the GT750, so do they fit? What's involved in making it work? Check this page for more details of the GS750 transmission with lots on input from Suzuki Dave Bonigut from the Sundial and other on line forums. If five close ratio gears are good, six have got to be better. That holds doubly true for a bike on which the performance has been improved and which needs more gears to stay in the powerband. See: 6 speed trans for the scoop.